Portland Intown Contra Dance enriches lives and cultivates a vibrant community through dance. Our series is delightful, welcoming to all humans, and a heck of a lot of fun. We gather every Thursday night for zesty, joyful dancing on the peninsula in Portland, Maine, and find ways to enjoy each other's company when we're not on the floor. We're teaching and practicing traditions, contributing to an evolving art form, and welcoming new dancers to our community every week. We dance with partners, and with everybody in the room. It doesn't matter what gender you are - you can boogie in both dance roles. Come alone or bring a friend! Get happy: loop yourself in by by joining our Facebook group and get in touch to volunteer. Thursday night dances typically cost $10 (cash, check, or debit/credit cards accepted), start with a brief orientation for beginners at 7PM, and continue with dancing 7:30-10PM. We also host occasional dances and other events on other nights of the week. See the event details for more info. find our detailed schedule here. And if you wanna dance all weekend, check out other dances in Maine on the DownEast Friends of the Folk Arts calendar or in New Hampshire on Contra Dance Links. When you arrive, follow the signs and enter through the courtyard. Thursday dances start with a brief orientation for beginners at 7PM, and continue with dancing 7:30-10PM. We also host occasional dances on other nights of the week that start and end at different times. See the event details for more info. Thursday night dances typically cost $10. We can accept cash, checks (made out to PICD), and debit/credit cards. We also occasionally host events other nights of the week with different admission fees, including free events. See the event details for more info. Parking is available on-street in the State Street/West End neighborhood. Simply driving around will yield a spot. In Portland, metered parking on Thursdays after 6PM is free! There are a few driveways in the immediate vicinity, but none of them are available to dancers. There are two on-street handicap parking spaces directly in front of the church on State Street. After you go through the courtyard and front door, which is on the right, there is a short stairway prior to entering the dance hall, for a total of about 10 steps. To access the elevator, use the door on the left as you enter the courtyard. There are two bathrooms that the church makes available for dancers. One has multiple toilet stalls and is designated by the church for "ladies." The other is for one user at a time and is open to all genders. SCENT: If you normally enjoy wearing perfume or cologne, do you mind coming without it on Thursday? Some of our dancers are physically sensitive to potent scents. We hope you understand. INTOXICATION: For multiple reasons, we don't allow the consumption of alcohol or other intoxicating substances at our events. If you come to the dance drunk or high, one of our organizers may ask you to leave and come back sober next time. Anyway, contra dance involves spinning around in circles a lot, so it's just a bad idea to drink and dance. PHOTOGRAPHY: Because these are public events, dancers and organizers from time to time take photos and videos at our contra dances and post them online (see example from Robyn Nicole Film & Photo or Youtube). You'll probably get a sweet profile pic out of it! However, if it is important to you to be left out of photographs and videos, please let an organizer know so we can pass the word to folks who are likely to be documenting the fun. JERKS: Come to Portland Intown Contra Dance ready to be awesome and respectful to everyone. If someone complains to an organizer that someone else is being a jerk, one of our organizers will talk to that person about it. We reserve the right to ban jerks from our dance for being jerks. See more info about consent at PICD events. VOLUNTEERS: We love volunteers. In exchange for volunteering, we offer free admission. If you want to help out at a dance, please email Courtney Ross, our volunteer coordinator, at volunteer@portlandintowncontradance.com. THANKS FOR CREATING THIS BEAUTIFUL COMMUNITY WITH US! 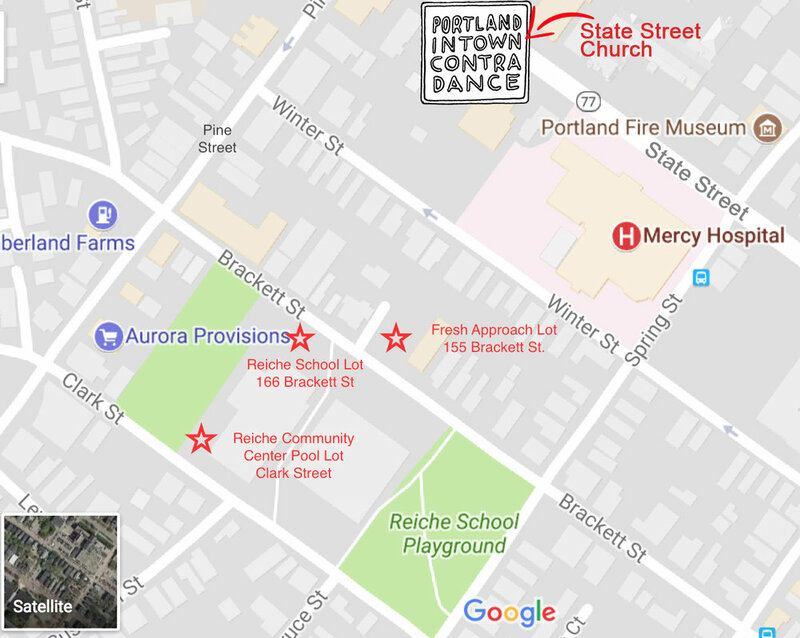 Portland Intown Contra Dance is sponsored by local businesses who care about our community. If your organization is interested in sponsoring us, we’d love that! Get in touch with Dugan Murphy at dugan@portlandintowncontradance.com for details. A fifth-generation Maine family business with garden house locations in Falmouth, Brunswick & Cumberland, they love to teach folks how best to plant, and they love dancing. Nuf Sed is a Portland, Maine-based communications & consulting boutique with a deep appreciation for what makes places, people and experiences extraordinary. They built this website! Pelletier, Chase & Associates is a full-service Certified Public Accounting (CPA) firm in Portland, Maine whose professionals have been helping Maine businesses grow for over 30 years.